Getting things done while my 4 month old daughter naps is like a giant game of roulette. I never know whether I'll have 20 minutes or 3 hours to get things done. This morning, I won at the baby casino. Not only did I get to shower, fold laundry, and do dishes while Miss M slept, I got to bake cookies too! I've had success with cake mix cookies before and this was no different. 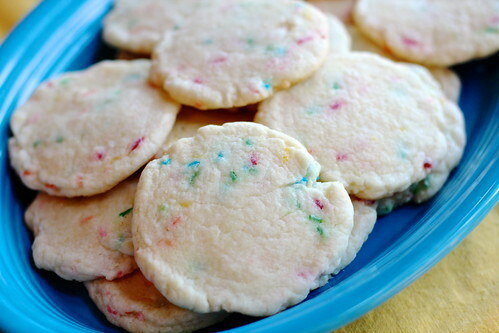 If you're a fan of funfetti cake, you'll love these cookies. The original recipe calls for frosting too but I don't think that's necessary. The cookies are borderline sickeningly sweet on their own, in a good way! 2. In a large bowl, stir all ingredients together using a wooden spoon or rubber spatula until well combined. 3. Using your hands, shape dough into 1 inch balls and place 2 inches apart on cookie sheets lined with foil or a silicone baking mat. Using the bottom of a juice glass dipped in flour, gently flatten each cookie to 1/4 inch thickness. 4. Bake for 6-8 minutes or until cookies appear set. Allow to cool before serving.